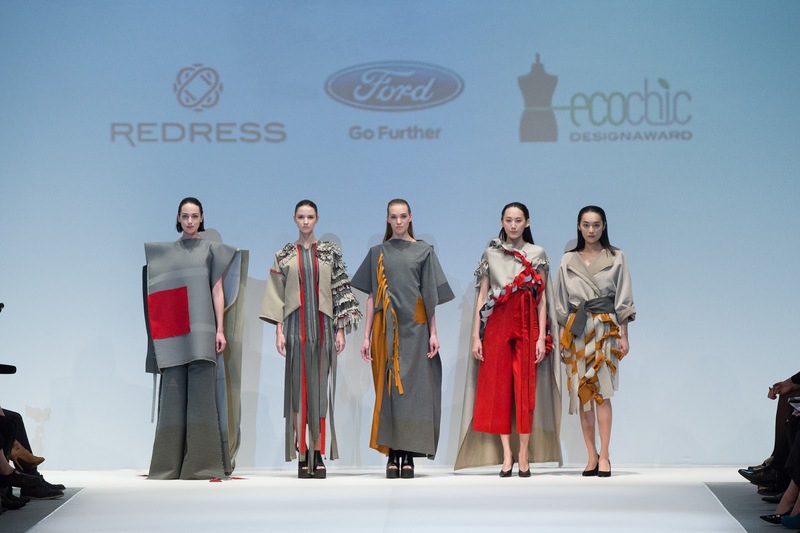 This week, Ford Motor Company made its debut on the Hong Kong Fashion Week runway as part of The EcoChic Design Award 2015/16 grand finale show. Five outfits featured in the show were made entirely from the up-cycling of Ford’s sustainable seat fabrics, which are made from recycled plastic bottles. The garments were designed at The Redress Forum 2016: Ford Design Challenge, in which 10 emerging designers were tasked with creating high-fashion outfits using Ford’s sustainable seat fabrics. When designing the collection, the designers – from Hong Kong, mainland China, Thailand, Poland, Spain and the United Kingdom – took inspiration from the landmarks of the city of Hong Kong. Amy Ward (United Kingdom) and Pan Wen (China) put forward this dramatic floor-length gown. The outfit – inspired by a quiet underpass on Hong Kong’s famous Victoria Peak – is characterized by the draping of Ford’s sustainable seat fabrics in contrasting hues of copper and neutral materials. Esther Lui (Hong Kong) and Patrycja Guzik (Poland) put forward this romantic jacket and dress. The ruffled sleeve of the jacket utilizes five different Ford fabrics, all hand-sewn in layers to create a fringed texture. Bella Benyasarn (Thailand) and Sara Kiani (United Kingdom) created a luxurious oversized kimono. Sashed at the waist, the outfit features weaved panels of different fabrics to elevate the overall look. Tsang Fan Yu (Hong Kong) and Annie MacKinnon (United Kingdom) created this voluminous tunic and floor-length skirt. Taking inspiration from the Man Mo Temple in Hong Kong, the dramatic outfit creates a strong and powerful silhouette. Wang Di (China) and Cora Bellotto (Spain) put forward this spiritually inspired outfit. A pair of tailored red pants is topped off with a floor-grazing jacket. The collar and lapels of the jacket are lined with plaited pieces of Ford’s fabrics. But how did Ford cross paths with the fashion industry? It’s all about sustainability. This is the second year in a row that Ford has teamed up with Redress to raise awareness about innovative ways to reduce waste through better design. “We armed these talented designers with off-cuts of our sustainable seat fabrics – which are made from recycled plastic water bottles,” said Marie Smyth, senior designer, Color and Materials Design, Ford Asia Pacific. “We wanted to give them the opportunity to work with this alternative material and show them that eco-friendly fabrics can come from surprising sources. Ford’s sponsorship of The EcoChic Design Award 2015/16 reflects the company’s long-standing and growing commitment to sustainable design research. Beyond seat fabrics, Ford produces storage bins using wheat-straw, dashboards padded with scrap cotton from recycled jeans and seat foam from a bioplastic made from soybeans. Today, the company continues to experiment with new biomaterials, including the use of tomato fibers from discarded tomato skins, seeds and stems and retired U.S. currency, to offset petroleum use in producing bins and other plastic parts for vehicle interiors. Research teams are also experimenting with biomimicry to develop a new sustainable adhesive for use under the hood. These efforts are all part of Ford’s global sustainability strategy to lessen its environmental footprint. Never knew about Ford Motors fashion. I usually follow at latintranslation.biz local designers and it is not interesting for me to search for high fashion.